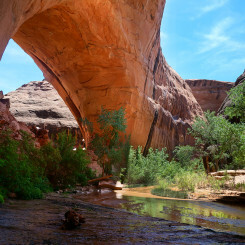 Hike Guide: Coyote Gulch (UP) – Across Utah! 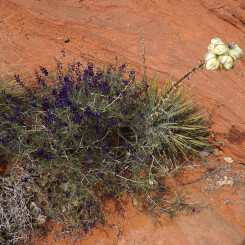 Here is my description headed UP the canyon from the Escalante all the way up to the Hurricane Wash Trailhead. 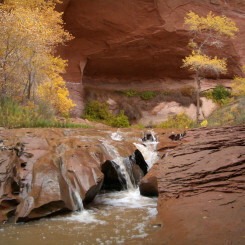 Or, if you plan to hike it the other direction, click here to view the alternate description for those going DOWN Coyote Gulch. 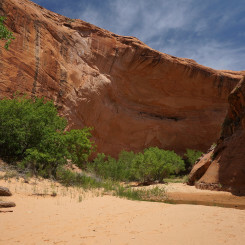 Congratulations you are at the Escalante River and ready to go up an amazing canyon! 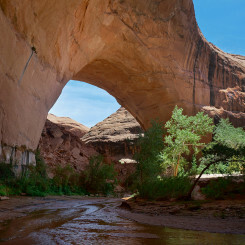 If you have come down the Escalante, you’ve already marveled at Stevens Arching hanging high above the river. 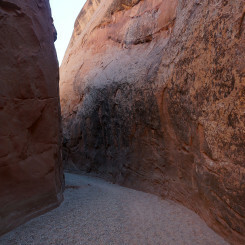 If you got to this point via Crack-in-the-Wall, take time to go up river a ways to see the incredible view. 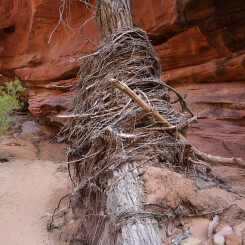 If time permits even explore around the bend and into Lower Stevens Canyon. 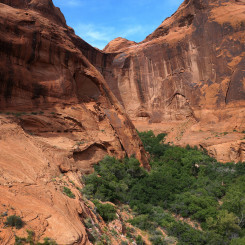 There is an alternate route back Lower Coyote if you wish to make a loop and take in an incredible viewpoint across from Stevens Arch. 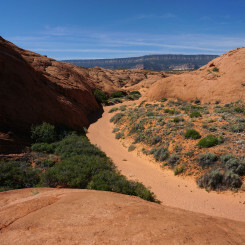 Digression aside and headed up Coyote Gulch: The stream from Coyote Gulch somewhat unceremoniously meets the Escalante. 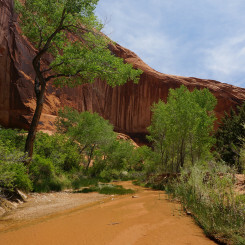 However, headed upstream the scenery immediately improves as the stream passes towering streaked walls before soon arriving at a rock/log jam which one must bypass. 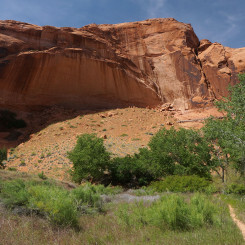 There are several ways to do this, but IMHO the best route is immediately on the left (LUC — looking up canyon) by traversing a sloping slickrock ramp up past the obstacle. This method does involves a bit of exposure which may give some pause (especially if traversing in wet/slick shoes.) 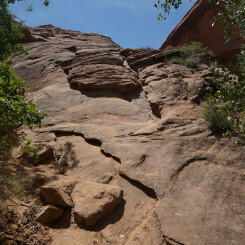 The alternates routes climb higher, but all involve a a tricky spot or two. 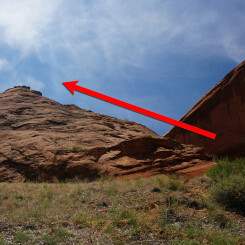 Those comfortable with walking on slickrock may pass this point without even noticing. Just up from the obstacle one will notice a well-worn route up a sand dune on the left. 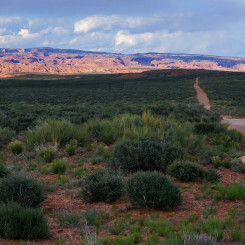 This is the trail up to the Crack-in-the-Wall exit route which leads to the TH at the end of the Forty Mile Ridge Road. 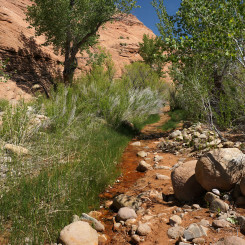 Not more than 1/2 mile up canyon one will see a bench with a few cottonwood trees on the right side of the stream which make for a good camp spot. 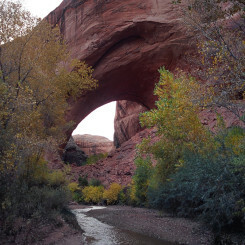 Here one can turn around and see Stevens Arch on the skyline. 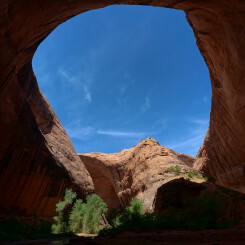 This is also the location where an alternate route exits the canyon on the northern side and climbs up and follows the Kayenta rock ledges downcanyon to a dramatic view across from the arch as well a less-used route down to the Escalante River via a side canyon to the north. 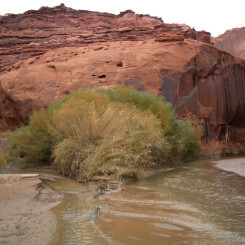 After this spot the canyon narrows and bit and becomes strewn with rocks. 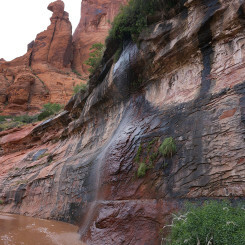 Signs of floods rushing through the canyon are evident and serve as a reminder one needs to always be aware of current weather conditions (especially those upstream). 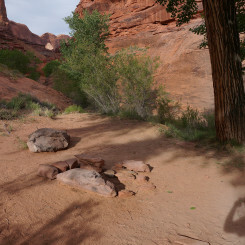 Camping in the Lower Coyote Gulch is not recommended unless you are well up on a bench. 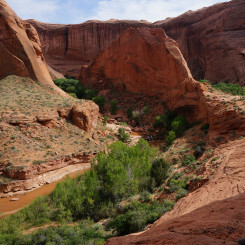 Soon the canyon begins to widen up a bit and take on a different feel. 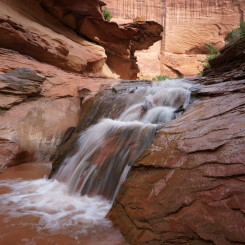 Ahead you will see a rolling cascade which marks the beginning of the next section of the canyon. 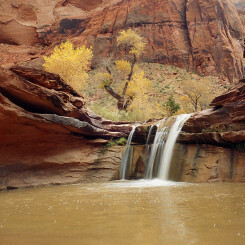 The next section of the canyon is dominated by five waterfalls. 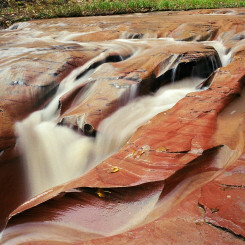 The first is more of a cascade really as the stream dances down a sloping incline of exfoliating slickrock. 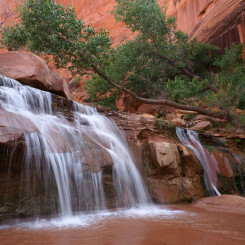 It’s easy to walk up right beside the cascade here. Above the falls one will notice an giant undercut alcove ahead. 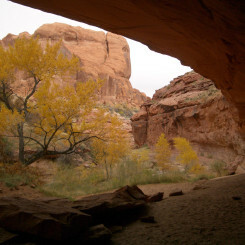 The alcove makes for an incredible group camping spot if you are fortunate to get there before others. 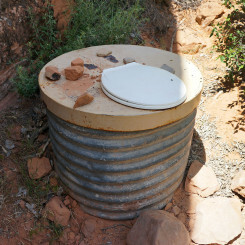 The area is so popular that there is a pit toilet nearby uphill on the northern side of the canyon across from the alcove. Just around the bend upstream is another fall pouring in from a spring high above on the right wall of the canyon. 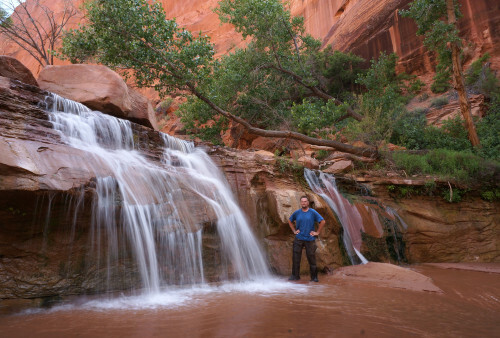 It doesn’t have as much volume as the falls in the main watercourse, but it’s still a spectacle to behold as the 30′ drop often fills the air with a fine mist of water. Continuing up canyon one soon arrives at the next waterfall. 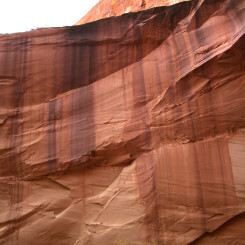 It falls/slides about 10′ over a rounded sandstone outcrop. This is probably the trickiest fall to get around as it requires a short scramble up the rockwall. 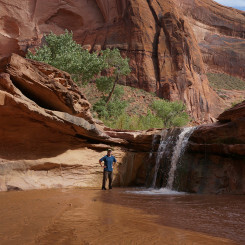 There are several places to do this, but the easiest in my opinion is back down from the falls around the bend near a tree on the left side (LUC). Continuing up canyon one quickly arrives at another waterfall. 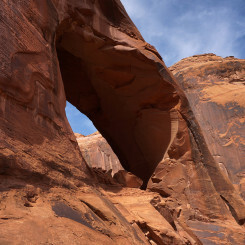 This one leaps about 9′ over the top of a flared sandstone ledge. 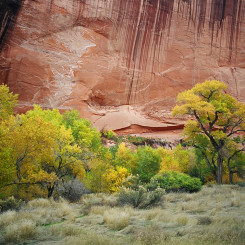 The cottonwood trees in the background make for a gorgeous scene here in autumn.Use a bypass on the left (LUC) to get past the drop and above the waterfall. Another bend or so and one will come to the final waterfall in this section and it’s arguably the best of the bunch. 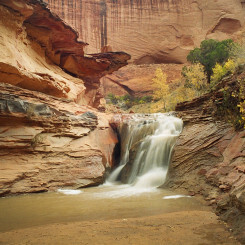 The Upper Falls sits below Cliff Arch and is the tallest along the main route at about 12′, With several interestesting angles to capture, it is a favorite among photographers. 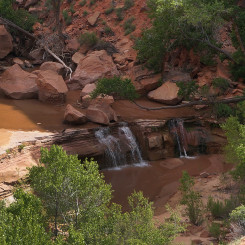 One may continue up canyon by using a bypass around Upper Falls. 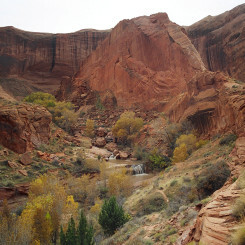 To get to the bypass one will likely have to backtrack a short ways and find the route on the south side of the canyon. 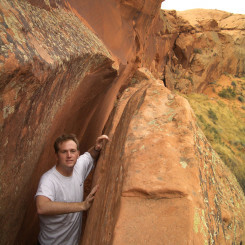 Another option is to back-track a bit and then climb up towards Cliff Arch. Instead of following the stream, it’s possible to exit on the north side and climb up to the saddle of the fin. 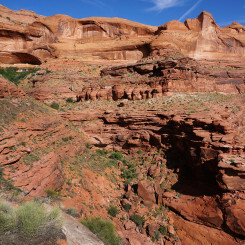 This is an excellent shortcut and provides an up-close view of Cliff Arch as well as the next section of canyon including the first of several waterfalls. 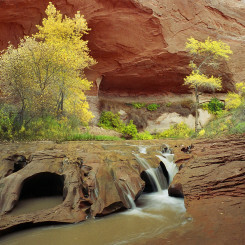 Whether you’ve used the short-cut or the meander, take care is getting back down to stream level below the waterfall. 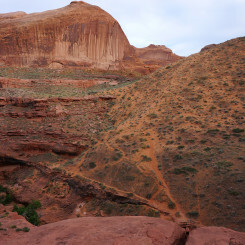 There are several use-trails which ascend/descend here on both sides of the canyon in questionable spots. If in doubt, take your time and explore — there’s always a fairly easy way to be found. 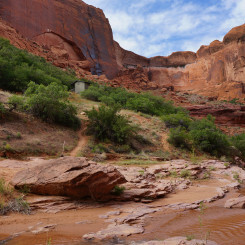 Along the next few bends, interior trails form away from the streams often with good camping spots along the way. Farther up an easy-to-miss side canyon enters from the right (LUC). 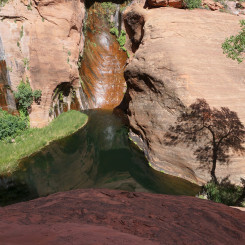 A brushy, splintered side-trail leads one back to what Allen calls The Black Pool in his guidebook. 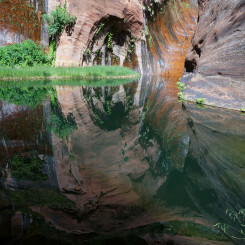 It’s an amazing pool underneath a mossy overhang. 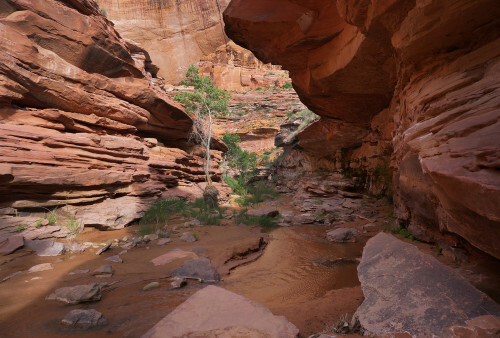 Back in the main canyon and continuing upstream there will be several hanging alcoves on the northern or right side of the canyon. 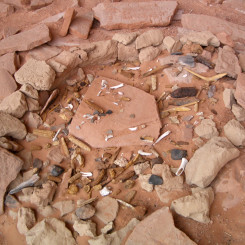 Some of these include relics of a past civilization. 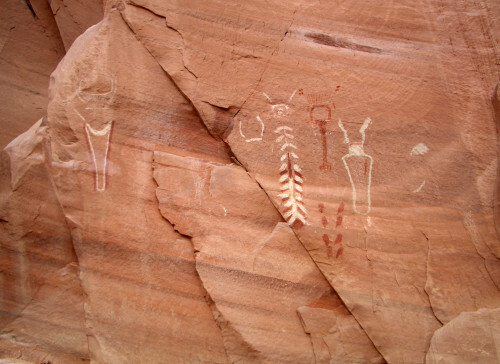 The first one immediately past the side canyon has a good set of pictographs if you are willing to climb up to them. 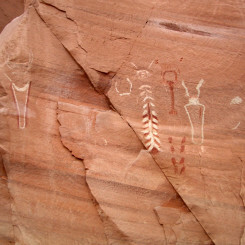 Remember, please don’t touch as the oils from our skin breaks down and destroys this ancient art. 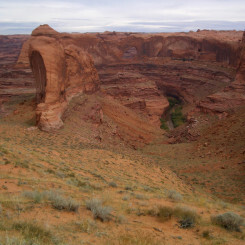 One more bend or so up canyon and one has arrived at Coyote Bridge. 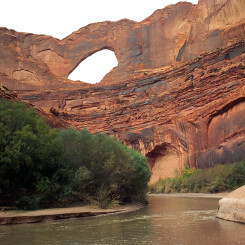 In many cases this has become the symbol of this iconic canyon. 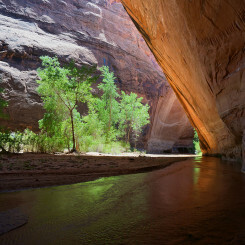 One walks right under the bridge and can enjoy the different, yet both beautifully unique, views from each side. 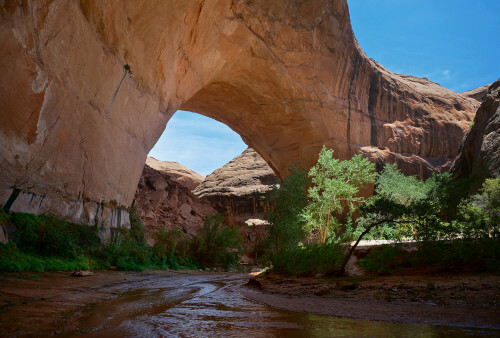 There is a good camping spot immediately adjacent to the bridge on the downstream side, however I would suggest not camping there unless it’s already late in evening and you plan an early start. IMHO there’s not much worse than arriving at an iconic backcountry spot only to find someone’s tent(s) perched right in front! 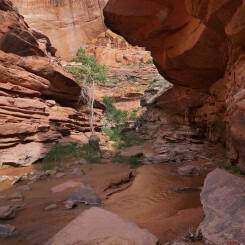 Just around the next bend is what I call ‘The Notch’ — a place where the streams cuts a short slot through the sandstone fin of a meander. 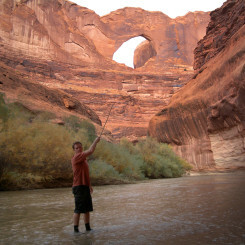 At times one can simply walk right through this spot in ankle-deep water. At other times it can be chest deep! If progress is blocked for any reason, there is a well-worn bypass trail around the meander to the south. 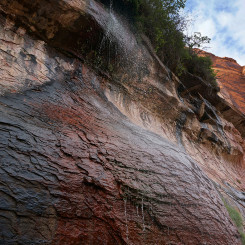 After another narrow section one comes to a favorite spot for photographers — Swiss Cheese Falls. That’s not an official name and I think it would be hard pressed to really consider this a waterfall, but it’s definitely a photogenic spot none-the-less. 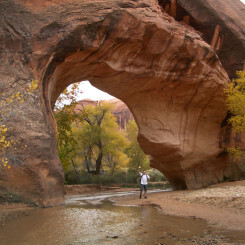 After a few of the bends one can see the spectacle that is Jacob Hamblin Arch (originally named Lobo Arch). It’s immense size can be startling. 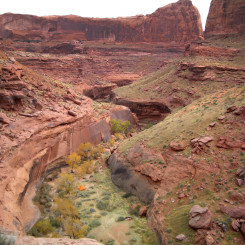 Before getting all the way to the arch there is another popular camping spot on the left. There is another pit toilet on the southern wall in this section as well. This is also the spot where a steep route comes down from the rim, providing access to Forty Mile Ridge Road. 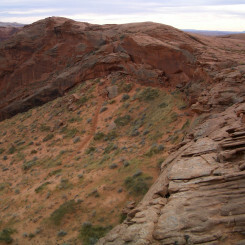 This route is not for the faint of heart and experience scrambling on slickrock is strongly suggested and probably a rope to haul packs up/down. 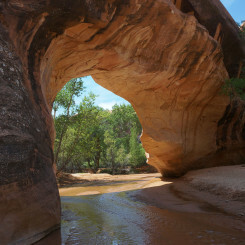 Back to Jacob Hamblin, it is possible to climb up and through the arch, but don’t short-cut it entirely and miss the undercut just south of the arch which is probably one of the best around (and a popular camping area.) 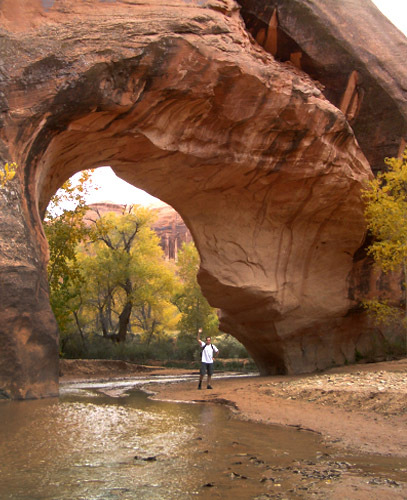 You’ll need a wide-angle lens to take it all in via camera. 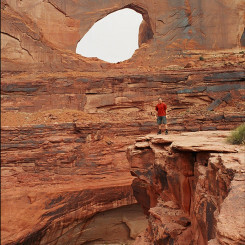 The fin which reaches down to this spot provides another route to the top via the northern rim. 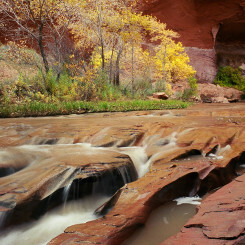 However this one is even more treacherous than the one down canyon. 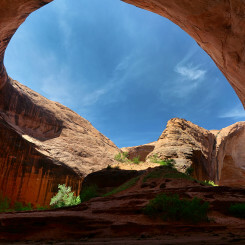 Though non-technical, this route includes extreme exposure so a rope is suggested and climbing experience mandatory. 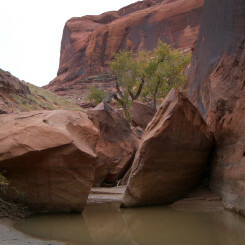 A few more bends up and the canyon walls will begin to diminish somewhat and you’ll see a stream entering from the left. 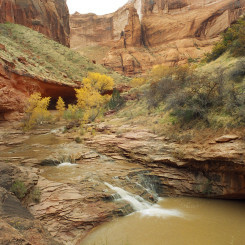 This is the junction of Hurricane Wash.
From the confluence of Hurricane and Coyote Gulch, to the right (upstream) is the alternate route to this point via the Red Well TH. 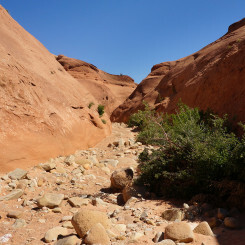 A short side-hike up this direction will take one to the scenic side canyon known as Sleepy Hollow. This guide will continue up Hurricane Wash however to the left. 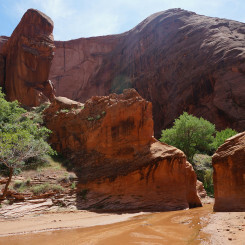 The Navajo sandstone walls continue to tower for the next several bends of the canyon. 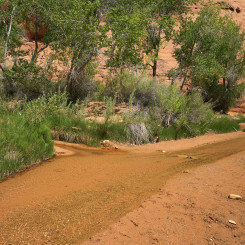 The stream gets smaller and smaller and almost suddenly dries up. 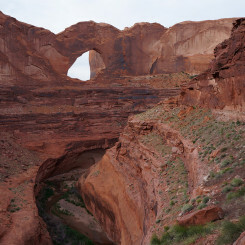 The landscape changes drastically from this point up. 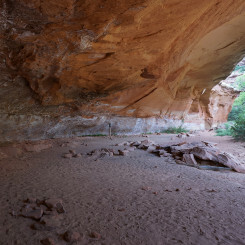 Though still somewhat entrenched, the canyon is much more barren and much more difficult to walk up the sand/stone-filled dry wash.
After a while the canyon opens up a bit and becomes even more desolate. 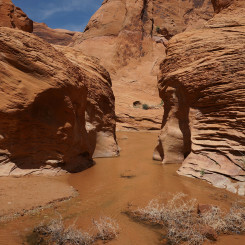 As one nears the Hole-in-the-Rock Road you might see minor outbreaks for water. Soon you will be at the road and the parking lot at the Trailhead. NOTE: if thru-hiking and water the best water possible, there is water tank near the cabin just a few hundred yards north of the parking area. 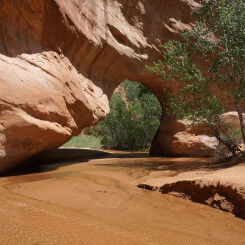 Pingback: Hike Guide: Coyote Gulch - Across Utah!